Kale. Spinach. Collards. Swiss Chard. Mustard Greens. Turnip Greens. Broccoli. Cabbage. Zucchini. Brussels Sprouts. These are some powerful vegetables filled with fiber, vitamins and minerals that can protect you from heart disease, diabetes and even cancer! What are in these magical green veggies that make them so awesome? Kale: Vitamin A, C and K. Calcium. Folate. Potassium. Manganese. Collards: Vitamin A, C and K. Magnesium.Calcium. Folate. Swiss Chard: Vitamin A, C and K. Magnesium. Copper. Mustard Greens: Vitamin A, C and K. Folate. Calcium. Potassium. Turnip Greens: Vitamin A, C and K. Calcium. Folate. Broccoli: Vitamin A, C and K. Chromium. Folate. Red/Green Cabbage: Vitamin B6, C and K. Manganese. Zucchini: Vitamin A, B2, B3 and C. Copper. Manganese. Brussels Sprouts: Vitamin A, C and K. Folate. Even though these veggies are packed with amazing nutrients for your body it can be hard to incorporate them into your diet. Most of these green veggies have a unique flavor which can turn a lot of people off or they are unsure of how to cook them. Smoothies: Fruit, yogurt, ice, nut butter and a handful of spinach or kale. The fruit covers up the taste of spinach and kale so add a handful then blend, taste and add more until you are satisfied with flavor. Chop it up! Add any of these greens to meatloaf, spaghetti, scrambled eggs or any other dish by chopping them into very small pieces so the taste is hidden. This is also a great way to sneak veggies into your kids! When in doubt add bacon: Although I don’t recommend eating veggies and bacon every night it can make for a quick and delicious side dish. Roast these greens with some bacon, sprinkle some salt/pepper and squeeze a bit of lemon on top post-roasting. My favorite way to eat kale is to make kale chips. Super easy and tastes delicious! 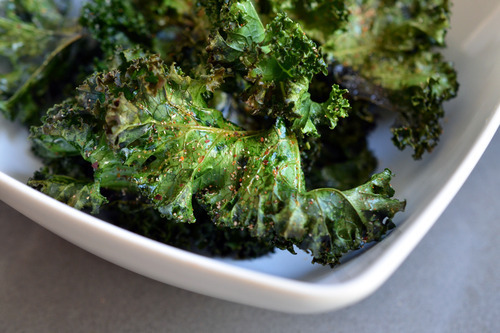 There are a million different ways you can spice kale chips so use what you like and get creative! I have used garlic, balsamic vinegar, nutritional yeast, cumin, paprika, taco seasoning and just plain old salt and pepper. The combinations are endless. Lay kale out on cookie sheet. Make sure kale is flat and aren’t overlapping. Cook for about 10 minutes, might need to rotate sheet depending on oven. Stay close to the oven! Kale chips burn very easily and turn bitter which is gross. Once out of the oven sprinkle some salt on them and eat! This is such an awesome post. GO VEGGIES! Thanks for the shout out! Thank you so much for sharing this article about greens. It was extremely helpful and so were the links. Toppers, Sauces and Condiments OH MY!